Beginning operations in 1997, Banker Steel has become an award-winning, AISC-certified steel fabricator with facilities in Virginia, Florida, and New Jersey totaling 565,000ft² specializing in projects up to 25,000 tons. Our technology allows us to provide 3D modeling, BIM (Building Information Modeling) capabilities, and electronic drawing management. This means we can adapt and react instantly to the changes in your project. 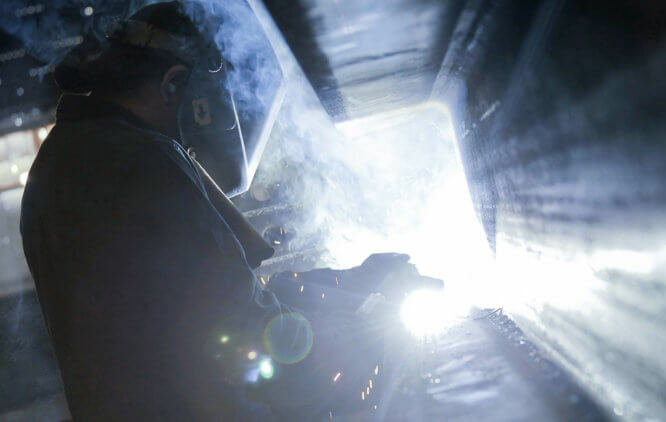 When it comes to fabrication, we utilize the most efficient modern technology. The use of Robotic Welders takes advantage of incredible return on investment (ROI). Faster cycle times, less wasted material, and a consistent end product provide savings. Our fabrication facilities are also equipped with automated burn tables. By matching each piece perfectly with engineered drawings, we improve overall component quality and significantly reduce rework and manufacturing costs. Our Quality Control System is in complete accordance with AISC (American Institute of Steel Construction) for Complex Steel Building Structures and Major Steel Bridges. We empower each employee with the authority to actively participate in the quality of your product and the continuous improvement of our Quality Systems. This process allows us to adhere to the demands of your schedule as well as maintaining control of the budgeted project cost. Banker Steel believes that all accidents and injuries are preventable. Our goal is to instill our workforce with the desire to continuously improve on accident prevention. All these factors create the right mix to fabricating not only a sound structure but also a solid and long-term relationship. At the end of the day, it's what makes your project that much more successful.